If you are a Special Education teacher visuals should be your BFF! We wouldn't be able to get through a normal run of the mill day in my classroom with out multiple visuals to help my friends be successful! 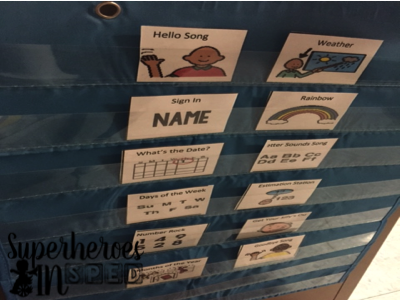 We use visuals for everything, but here are some good examples of visuals and visual reinforcement to help our day run smoothly! One of my students benefits from a really detailed schedule for each transition. His 1:1 aide carries around a binder with his schedule in small chucks so he is not overwhelmed and can reference it in all settings. 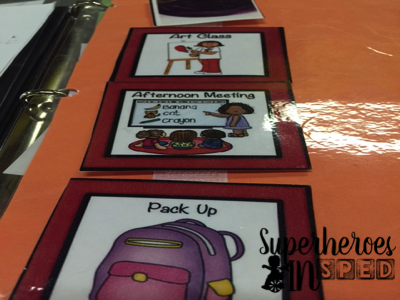 The binder is divided by color coded pages with the visuals sorted by categories so we can find them in a pinch! 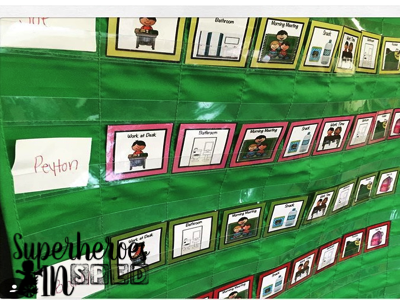 The categories are reinforcement, academics, specials, and different activities in the classroom to name a few. Visuals are also in the classroom for reinforcement. Each of my students have an individualized behavior reinforcement and target reinforcement plan. These visuals give the students positive reinforcement when they reach their target behavior. 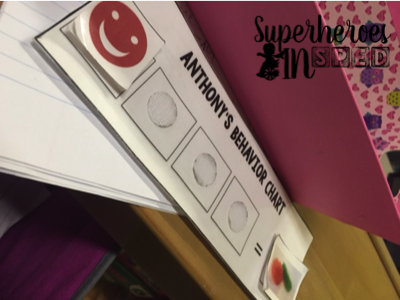 It can be a lot to keep track of, but each student's target behavior will help them be the most successful i nthe classroom. 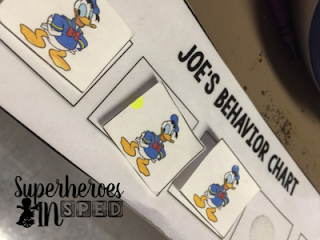 The first visual below was one that our behavioral therapist brought in one day after doing a reinforcement assessment on one student. He craved the attention of the teacher in the room (me) from day one. I was slightly mortified to have my face on a token board, but let me tell you for an child who loves the attention of adults, it works like a charm. He is given a token every 2 minutes as long as he is attending to the task at hand. Once he earns 4 "Miss Julie Stickers" he gets a hug from any adult in the room (his choice). He LOVES THIS! It was a little unconventional for me, but sometimes you have to look outside the box! 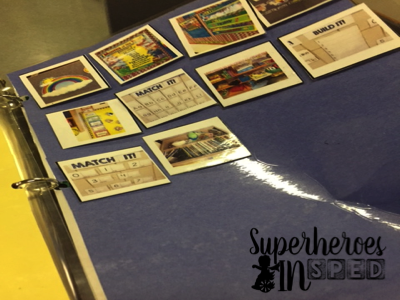 The second token board is a run of the mill task completion board. For every task this child completes he gets a smile and 4 smiles = 2 minutes of a choice activity. The third token board is a Donald Duck board. Donald was chosen by the student so it was especially reinforcing to him. 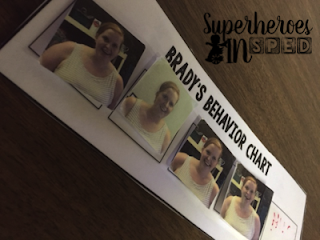 This is a non contingent token board and he is given tokens as good behavior and task compliance is accomplished. Once he earns 5 tokens he gets 2 minutes of a choice activity. My parapros and I also carry around visuals on our id badges everyday. 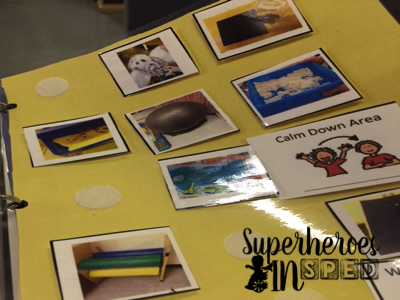 These range from, quiet mouth, hands to self, line up, bathroom....This really helps to eliminate the verbal prompting to take place and the students become more independent. These are also in the schedule cards pack in the link above! 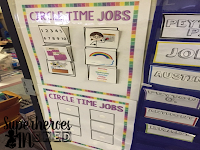 Lastly, I have visuals in my circle time area. 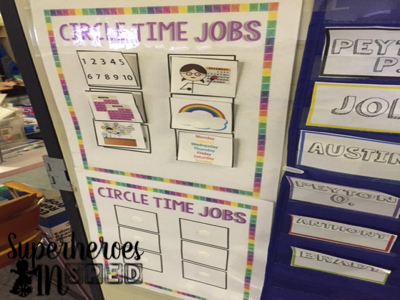 This helps give the students a visual schedule of each song and activity we will do during circle. I also have visuals of the jobs the students pick when they sign in. This really helps when my students get fixated on a job. It is much easier to handle letting someone else pick a job if they choose the visual picture first. Hope you all got some good tips on visuals in the classroom. This post just scratched the surface of visuals. I try to live by the rule "When in doubt, use a visual"! 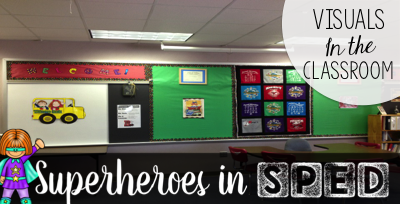 Leave a comment below and let me know how you use visuals in your classroom! Thanks so much for the shoutout, Julie! Your classroom looks amazing and this was a great post! Love the different ways you use the token systems as well as the different tokens! So cool!! NO Problem! Its a great product! I'm curious how you wear the visuals on your badge. I could see using "walking feet" and "inside voice" and one other could be helpful. Thanks. I use the small visuals from the schedule pack in the link. We use walking, line up, quiet mouth, quiet hands....Anything that we say to the students on the go that they should know already. It is super important to do this so they don't become too prompt dependent!